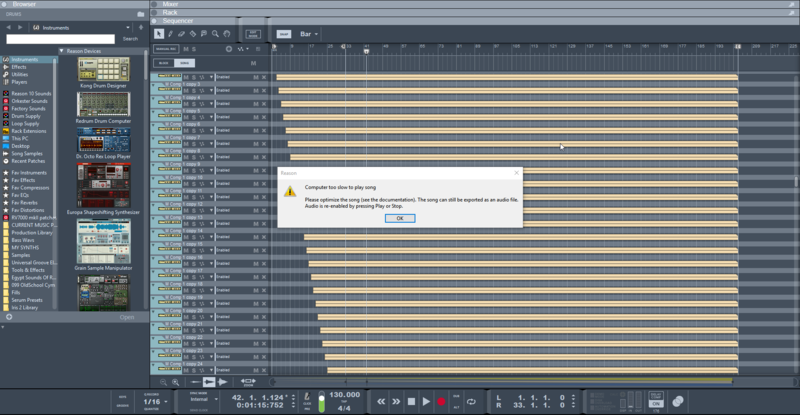 Reason 10, Windows 10 x64 professional. I got 28 seconds with 128 samples so not really a huge difference. Computer's getting old but I have not experienced any showstoppers in performance for what I do. Amazing performance/$ !!! Thanks for sharing the result! how much power is offered for complex polyphonic workloads. So i have a few results to show. Before today i was running an i7 6700K @ 4.5GHz (4 core 8 thread), with an Asus maximus viii Hero & 16gb of 3000MHz DDR4. Also i am using a Focusrite Scarlett 2i4 on both configs, at 44.1k and 884 samples, looking to swap the interface out for something better soon too. I upgraded to an i9 7900x, with an Asus TUF X299 Mark 1 mobo, also getting 32gb of 3000MHz Quad channel Gskill ram next week, but for these tests right now i am only running in dual channel with the same 16Gb of ram, will update when i get new ram in, though i suspect it wont affect times much. Now i will probably be able to bump these numbers even higher with a soundcard that has a better driver/converter in it, like an RME interface or antelope, but for now its still a huge improvement over the 6700k and im very happy so far! I knew id be getting worse singel core performance as the i7 was a gaming chip and still is extremely good at single threaded workloads, but im ok with trading off a bit of single core power for a huge increase in multithreading. All research I been doing this past week on a new workstation is pointing at this exact same CPU and mobo with DDR4 that you have here, Psuper. But before that I present the best score on the old setup: i7 4790k OC 4.7GHz, RAM 16GB DDR3 2400MHz - 24,265 sec in Complex benchmark song. Operation system -windows 7 utimate was installed in 2014, benchmark made week ago. Because on the new setup I was not satisfied about performance (around 40sec in complex bench) especially compared to the great result of Psuper on his 8700k and Protostar 7900x I did a lot of work to optimize the windows system and set the bios. In addition, I introduced a delicate overlocking. Of course had in mind great xeon results too ! 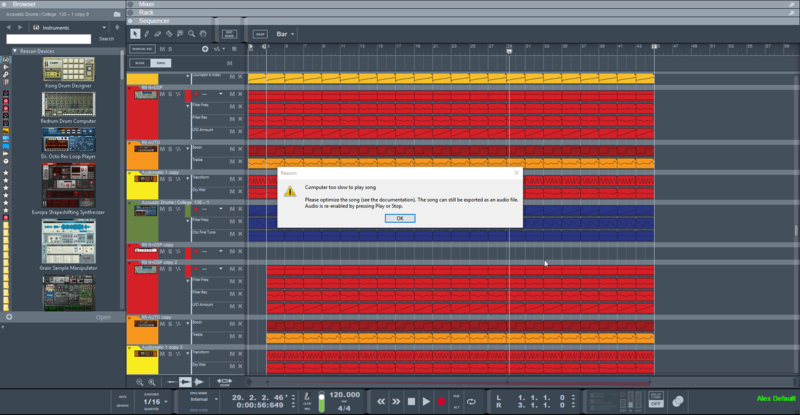 In case someone need this specific info in the future I observed that RAM has great input to the overall performance in Reason workflow. Greater than the cpu OC. I read that this is common on a Skylake chipset. In detail - cpu overlocked from 4,3GHz (fixed) to 4,6Ghz (fixed) improved Reason performance in benchmark complex song for about 1-2 extra seconds. Overlocked RAM from 2800MHz CL15 to 3200MHz CL15 improved Reason performance in benchmark complex song for about 8 extra seconds. Someone from Reason community could make test and confirm that observation. It doesn't make much of a difference what card you use. I ran the V2 again with "DX Primary Sound Driver" at 44.1 / 1024 samples and got 47 seconds, bar 24.3. Keep in mind while everyone likes raw performance, I focused this build on cool and quiet (and offline once I decide if I'm keeping the Discreet 4 or not), hence some of the unconventional parts and way it's built. At max load I hit 46c and total silence, no case fans running, cpu fan stayed at lowest rpm. Those results dont make much sense to me. My friend has the exact same chip as you and can only get around 26 secs on dx primary sound driver, and youre not even overclocked on your chip. Is there something special you're doing in windows to get this result? Or are you prepping the song file in any way by minimising devices etc? As I mentioned I haven't even begun optimizing my system software or hardware - just raw choice components at the moment vanilla everything. Either he has HT off or there's something wrong with his hardware setup. Have him run the benchmark software on http://www.userbenchmark.com/ so he can see where he sits with others of similar hardware. My friend didn't tell me he was only running 1 stick of 16gb ddr4, so its only running single channel memory atm. Made him order 2 new sticks to run in dual channel config for double bandwidth, so will update with those results. But just so you know, most motherboards wont impact your benchmarks whatsoever really, and same goes for ram speed (in music at least), even a difference in CAS latency wont do much, its moreso about the bandwidth, same goes for having a wifi adapter on/off. Yikes... talk about a overarching bottleneck for a new system! Yup, with dual channel RAM he gets 46 secs now lmao, everything adds up now haha! Very nice CPU for cost! Been considering making a cross DAW VST benchmark to compare Reason vs Fl Studio etc in VST performance too, will post if i end up making it! Last edited by Protostar on 18 Jan 2018, edited 1 time in total. I'd really love to see this. It got quite choppy at the end but that's due to the standard driver methinks. I've only had this PC for a few days now and it has massive overclocking potential. There's one user here who has an i9 OC'd to 5GHz, would be interesting to see the benchmark results on that machine (and the power consumption ). One thing that is really astonishing about this CPU is how efficient it is. In a regular "office"-like usage scenario, the whole system consumes ~125W (~45W for the CPU, ~36W with all cstates enabled, 7W for the whole system when it's sleeping, ~38°C CPU temperature under normal load). When compiling large projects (I am also using this for software development), power consumption goes up to ~140W (~42°C CPU temperature), and the build times are actually 4 times shorter than on my previous machine. 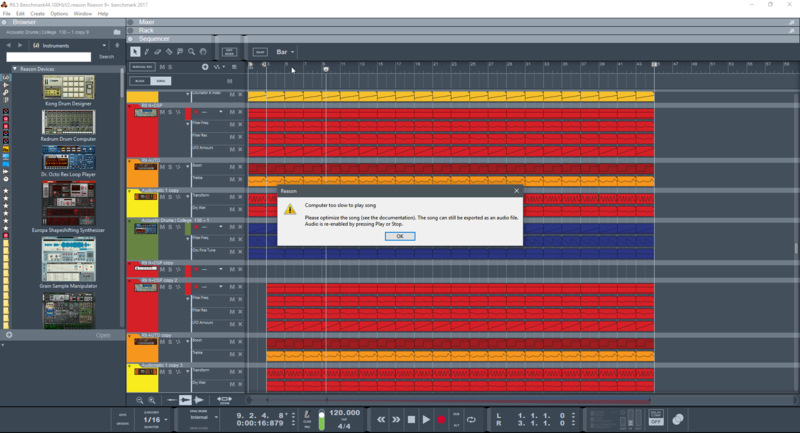 When it comes to audio production, I think you're currently better off with a fast 8 (or maybe 10) core CPU, since the software (tested with Reason+Reaper) is apparently not able to fully utilize all cores properly -- also see my other comments in my post in the Reason 8.1 benchmark thread. As you can see, audio dropouts are usually starting long before the "too slow" message, and at least as far as I am concerned, I want near-realtime performance since I usually arrange+modulate things "live" (using my custom made sequencer + Reason as a soundgenerator+tape recorder). Don't get me wrong: Reason is quite capable of multi-core rendering, it only gets problematic when single tracks/combinators exceed ~4 CPU bars. It's quite possible to run a large amount of moderately heavy synths like Respire, eXpanse, Diva, Bazille, etc on this machine (tested with up to 16 instances of Respire). My old PC (i7 4770k) could not run more than 3..
Dropouts depend on the whole system configuration, sound card, os optimization, peripherals, connections, applications in the background. For example in complex reason benchmark song with 512 samples of latency I have dropouts start at 32sec (hyperthreading off in Reason), and start at 36sec (HT on). Cpu i7 7820x, ram 3000mhz, Motu Track 16 usb, system optimized, cpu fixed. I think You can easly beat your results with that amount of computing power of your cpu after some optimization and modify configuration. You Have 2666MHz Ram. Set it on 3200MHz (You said in other post to have 3200MHz native ram speed) and check the performance increase in reason complex if You want. I set the RAM clock to "3200Mhz" in the BIOS (i.e. 2x1600MHz) and repeated the complex test @1024 samples. The result was exactly the same as with the 2666 setting ("too slow" after 1:21min). Then I enabled the CPU "turbo mode" (overclocks all 18 cores up to 3400MHz). Now the complex test finished without dropouts (@512 and 1024 samples) (max CPU temp. 46°, ~190W total power consumption). @256 samples it also plays until the end but crackles a bit. With turbo mode enabled, the fxchain test stops playing @1:36 (@1024 samples, no dropouts). At a 256 sample buffer size, dropouts start at ~0:55 and the "too slow" message appears at 2:10, @64 samples at 2:44. Well, my "ram theory" isn't correct in your case. According to your results, many users have had better results in fxchain benchmark with HT off in Reason. After a few days with my newly assembled computer, I have the HT option turned off, recently I noticed that the project with many respire, expanse, plus audio tracks, vst's and other rack extensions has more stability without hyperthreading. But it seems that it depends on the specifics of each song.